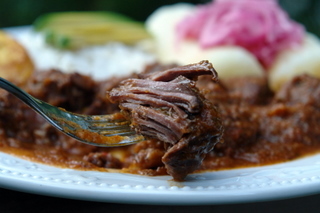 A good plate of beef stew in tamarind sauce, called seco de carne con tamarindo in Ecuador, is perfect for this time of the year when it starts to cool down and you need something comforting to warm you up. 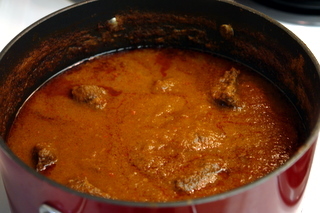 The flavors of the meat slowly cooked in a sauce of tamarind, beer, garlic, cumin, achiote, oregano, peppers, onions, cilantro, parsley, tomatoes, and other spices, is an ideal mix of spicy, sweet and salty. 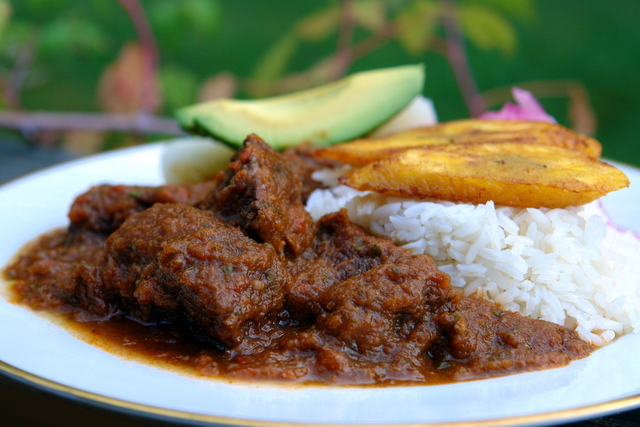 Secos are a type of stew and are very popular in Ecuador and other South American countries. These yummy stews are usually made with beef, goat, lamb, pork or chicken, but fish can also be used. 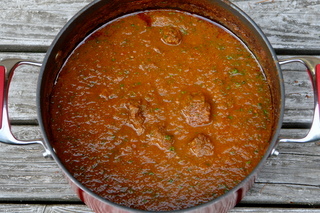 The meat or poultry is slow cooked in a sauce made from a combination of liquid that can include beer, chicha, fruit juice, or wine, along with vegetables such as tomatoes, onions and/or peppers; and various different seasonings, spices and herbs –garlic, cumin, coriander, achiote, cinnamon, cilantro, parsley, oregano, among others. 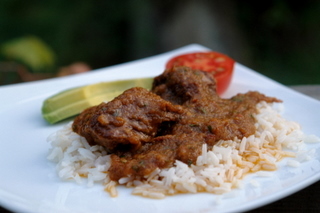 The exact ingredients and quantities vary from one type of seco to another, as well as from one region to another, but the goal is always the same: to obtain a delicious tender meat that breaks easily with a fork and that melts in your mouth, all inside a very flavorful sauce that has slowly absorbed each distinct flavor to create one amazing taste. Recipe for beef stew in tamarind sauce, also known as Ecuadorian seco de carne con tamarindo, made by simmering meat in sauce of tamarind, beer, garlic, cumin, achiote, peppers, onions, cilantro or parsley, tomatoes, and other spices. 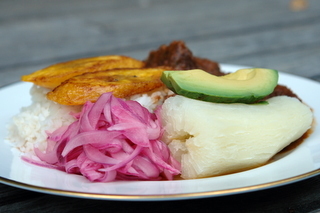 Rice, fried ripe plantains, boiled yuca, avocado slices and red onion curtido. Season the beef with the cumin, all spice, achiote, salt, pepper. 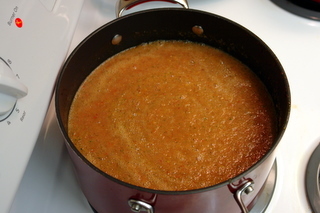 Blend the onions, peppers, tomatoes, garlic and ½ of the cilantro with the tamarind juice or pulp until you get a smooth puree. Heat the oil over medium high heat, sauté the meat until lightly browned on each side. Add the tamarind puree sauce, grated panela and beer, bring to a boil. Reduce heat and simmer until the meat is very tender and the sauce has thickened, about 1 ½ to 2 hours, sprinkle with remaining cilantro. 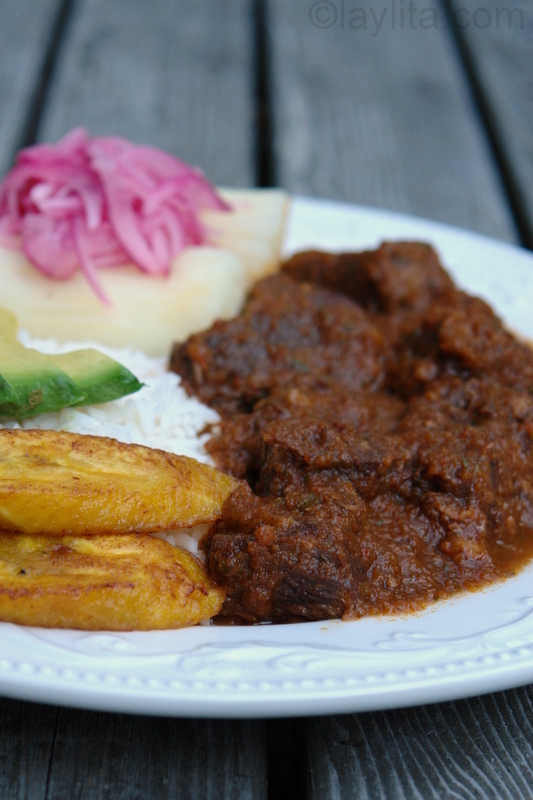 Serve with rice, fried ripe plantains, yuca, avocado slices, and curtido or red pickled onions. I’ve mentioned before that secos are one of the best comfort dishes and I especially crave them when it is cold. I also love the versatility of these stews, you can make a great seco de carne or beef stew by preparing it in the most well known way –at least in Ecuador – which is with beer. In past times it used to be that secos were always prepared with chicha, which is a fermented corn drink,but now beer has replaced chicha as the liquid of choice to prepare a good seco. I wanted to change this seco de carne and used tamarind pulp instead of only beer – or naranjilla juice which is also very popular. I have great memories of my mom buying huge amounts of tamarind. Sometimes she would buy the whole beans and other times she would buy these packs of tamarind where the bean shells had been removed and the flesh and seeds were tightly packed into a medium sized plastic bag. The tamarind in those bags had a very intense taste, I loved getting a spoonful of it and eating it pure – it was good but very strong. My mom would boil it with water and panela or brown sugar to make fresco de tamarindo – a very refreshing drink. For this recipe I used frozen tamarind pulp, in the Latin grocery stores you can find an assortment of frozen concentrate or pulps of different fruits in their freezer section. If you can’t find the frozen pulp you can use tamarind juice, but if it has added sugar then don’t add the panela or brown sugar or the sauce will be too sweet. I’ve seen the tamarind beans at a few supermarkets, you can also use those, simply peel the hard skin off, boil the insides –seeds and all- with a cup of water,then remove the seeds, you can taste it and make it as concentrated as you like. The only problem with the beans or pods is that they aren’t always very fresh, and in those cases the flavor won’t be as concentrated, so it’s best to get the frozen concentrate or the paste that they sell in Asian supermarkets. One of the best parts of a good seco is the sauce, which is why secos are always served with rice: it is the best way to soak up the delicious sauce. 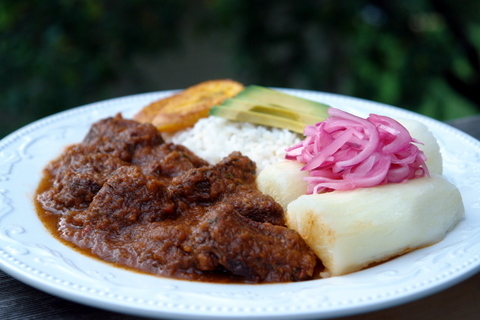 Other typical side dishes include boiled or fried yucas or cassava root– a starchy vegetable similar to potatoes but still very different , as well as fried sweet plantains,pickled red onions or a small salad, avocado slices, and hot sauce. This recipe is so much like my mom’s seco. I love your site and every single Ecuadorian recipe. My life is much happier since I found your website. I live in Japan and never thought I would be able to cook authentic Ecuadorian food. Your substitutions ( beer and orange juice for chicha, paprika for achitote) are great and makes it possible for me to cook. It is possible now to buy verdes from Ecuador from time to time in Japan so I was even able to enjoy bolones, chifles and patacones. 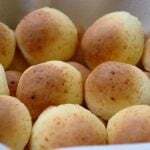 My daughter and I had so much fun making guaguas de pan. I am from Ambato so it was great to share that with her. Thanks again for making it possible. Your site is awesome. This is going to be the first recipe I try. For the lamb, is there a preferred cut that you use? Just wondering what part of the lamb to order before heading to the butcher. Thanks! Hi Chris – I usually use a boneless leg roast type of cut. Hello, your recipes (and pictures) look fabulous! We live in Canada, but my husband is Ecuadorian, so I’m excited to be able to give him more of a taste of home :) I want to make this seco, but for tamarind I could only find the flesh tightly packed into a plastic bag (seedless). I imagine this would be too strong a flavour if I used 14 oz of it? Or should I boil it in water? I notice in one of the comments above, you said that when using beans, we should boil 12-15 beans in 1 1/2 cups water. If I boil the tamarind I have, how much do you think I should use? Hi Sharon – You probably want to use half of the pack you have, about 7-8 oz max. Boil it with 1 1/2 cups of water, (but don’t boil for long, just a couple of minutes), then stir it until it starts to dissolve in the water. Once it’s dissolved, then strain it and use it in the recipe. Also, taste it to make sure it’s concentrated enough, depending on the quality of the tamarind it can be less flavorful or sometimes lose flavor over time. I love secos :D Nice to see some interesting variant of the traditional seco. I have made my owns too. My husband grew up in Ecuador and has “favorited” just about every recipe on your site! I’ve made this seco several times now, twice for company, and everyone always loves it. It’s a definite winner! I backpacked around South America last year and loved it — such an exciting place to go! I try to take myself back there in my cooking. I made your beautiful seco a few nights ago and was transported back to Brazil, actually — it reminds me of a lunch I had on a Pousada near Campo Grande. Your blog is fantastic. Thank you for providing all the recipes of the food I ate and loved during my travels. 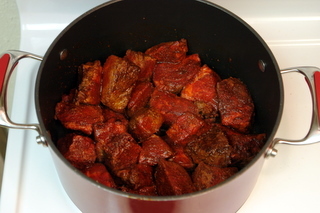 Wow, just discovered this site and I can’t wait to make my own seco de carne! Just wondering, should the pot be covered or uncovered while we simmer for about 2 hours? I’m thinking that would make a difference in how much the sauce reduces. Thanks! I usually have it covered for the first half of cooking, partially covered for the next 1/4 and then off for the last 1/4. I have some concentrate cooking tamarind that I buy at my local Vietnamise grocery store it’s a liquied concentrate (sour) I use to make Pad Thau, but I think that maybr I can substituted for the Pods, I love Secos, my husband is from Peru and they make them a lot, I’m Dominican, but I love cooking foods from all over the world! Thanks Sandra. Oh wow, this sounds amazing. I have a block of tamarind in the pantry that needs to be used. I’m so excited about combining it with the peppers, spices and beer! I’ll let you know how it goes. I made it with the tomate de arbol pulp and it was good! I think tamarind would still be better but it came out good either way. The color was a lot lighter though. Thank you for the great recipe! I would love to know what your recipe for aji is with tomate de arbol as well as more mote recipes! I have been making a lot of your food and it’s delicious and perfect since I am in Ecuador where I can find all of the ingredients easily (except tamarind!) Take care. 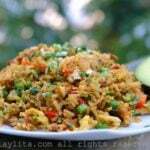 I am going to make this tomorrow but I couldn’t find tamarind pulp anywhere! Do they use it in Ecuador? I live in Quito and just bought pulp of tomate de arbol instead. I hope that works okay! I didn’t see any other pulp that looked appropriate. 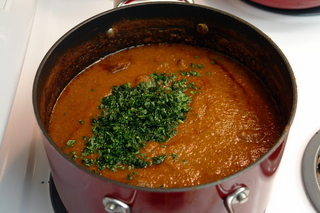 Hi Kathleen – I’ve never used tomate de arbol for this stew, but I have used it for sauces for fish or just for making aji, let me know if it works. I’m not sure about in Quito, but in my city – Loja- you could find tamarind pulp at the mercado (or market). This tamarind pulp is sour, right? I found Tamarind juice in an asian store that’s from Thailand (I think). Can I use this instead? Thanks. You can use the juice, if it has added sugar just leave out the panela or brown sugar so that the stew doesn’t turn out too sweet. I made this with tamarind paste rather than pulp, since it was the only thing I could find. However, I think it might be much stronger than the pulp. I used half of what you recommended but it still came out tasting too sharply of the tamarind. Do you have any experience with the paste or any recommendation as to the amount to use to get the correct flavor? If I do it again I’ll probably only use a tablespoon or two. Great recipe, though, and everything on your site looks great. Can this dish be done with chicken? I don’t eat beef. thanks. Yes, it can be be made with chicken also. Once you reach step 5 could you put everything in a crock pot and leave it to cook for 8-10 hours on a really low temperature or does this need ot be made on the stove top? Hi Tara – Making it in a crock pot should work as well. Oh my gosh, that’s gorgeous! And you’re right, it’s the perfect time of year for it, too. I’m remembering this one! My husband is Ecuadorian and I would like to make this recipe, however I’m not exactly sure how to make the Tamarindo pulp. How many tamarindo beans do I use, for how long do i boil the tamarindo? After I boil them and throw out the seeds do I add more water or do I just use the boiled water? Thank you. Hi Debra – Use about 12-15 beans, remove the hard skin and boil the pulp and seeds with about 1 1/2 cups of water, stir frequently, the pulp part should begin to dissolve and separate from the seeds after boiling, at this point you can strain the seeds and use 1 1/2 cups of tamarind liquid to make the seco. Also taste it to make sure that none of the beans have gone bad – the taste should be very tart. If you have any extra liquid leftover you can add water and sugar to make a fresco or tamarind drink. I bought achiote in the past, but I never used it, I didn’t know what to do with it. Mine came in cubes. What is it exactly? Hi Pia – Achiote is made from a red seed, it is mainly used to add color to food, the flavor is really minimal. Most of the time I buy it already ground, though you can also find the whole seeds. The cubes you have probably contain achiote as well as other spices, the only thing about buying the cubes or achiote seasonings that are already mixed is that you should read the ingredient list, many times they have MSG (if the ingredients are in Spanish it is called ajinomoto or glutamato monosodico). How can anybody not love this dish? It’s brilliant. That looks tasty! I am always looking for more tamarind recipes. Does the frozen tamarind pulp already have the seeds removed? Hi Nate – Yes, it does. I don’t know if I could find all the ingredients to make this around here. I’d love to make it because it looks so good. Tamarind… I’ve had a stew that looks like this, but never figured out that it might have gotten its wonderful flavor from tamarind. Brilliant! Good gracious, this looks incredible! I have not yet cooked with tamarind, but this would surely encourage me to do so. One of my favorite things is seco. delicious!!! Oh my, that looks so good! I’ll try that tomorrow. Thanks! I love your photos, they are so clear and colorful. Hi Soledad – Any bell pepper is fine. First of all, my mouth is literally watering. 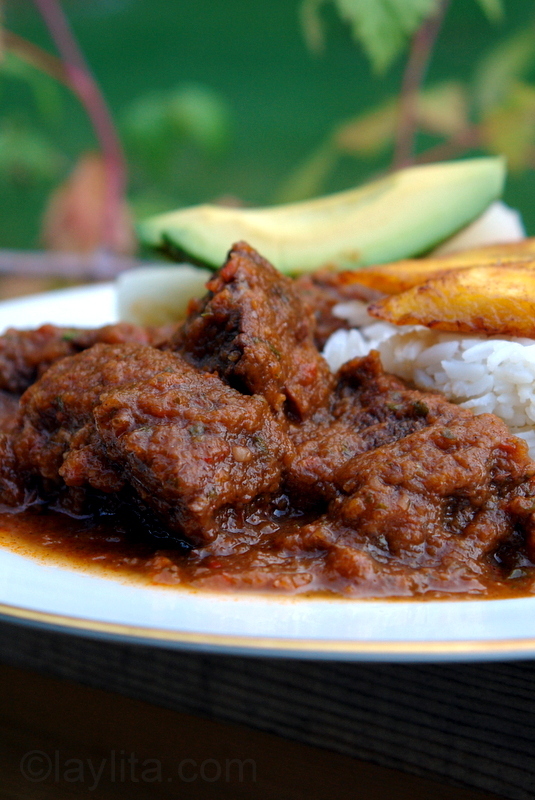 I love the idea of adding tamarind and beer to the guisado. Once again, a great post with beautiful photos. Que rico! This looks so delicious! Oh this looks so amazing…I can’t wait to try it! And I know where to find Yucca root too…and tamarind! That dish looks so good! I really like the taste of tamarind. The kind of food I crave!